Ashill, from the Old English meaning ‘the wood where ash trees grow’, is in Breckland in the southwest of Norfolk. In Domesday Book woodland capable of supporting 100 pigs still existed in the parish, but the population of the settlement was small. The modern settlement of Ashill is a small village, with farms scattered around the edges of former commons. A Mesolithic blade (NHER 4649) and Neolithic flint implements (NHER 4658, 4659 and 17644) are the earliest evidence of occupation. There is a significant amount of Bronze Age activity clustered in the northeast of the parish close to a Roman enclosure (NHER 8712) and the Panworth Ditch (NHER 1082), suggesting that this area has always held a special significance. 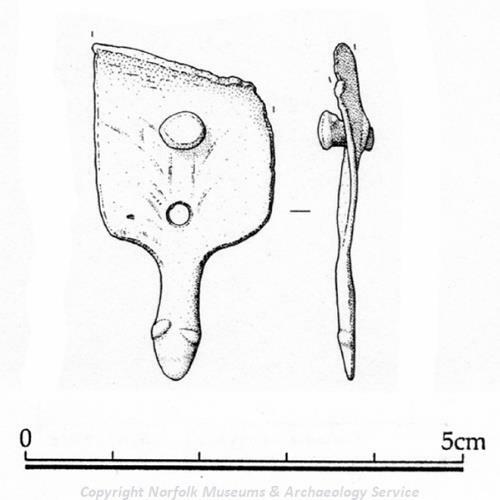 Bronze Age barrows (NHER 4660 and 4661) have been recorded, alongside a dirk (NHER 8710), a spearhead (NHER 28012) and the tip of a sword (NHER 34627). A gold torc (NHER 4663) was discovered in the southwest of the parish in 1856. 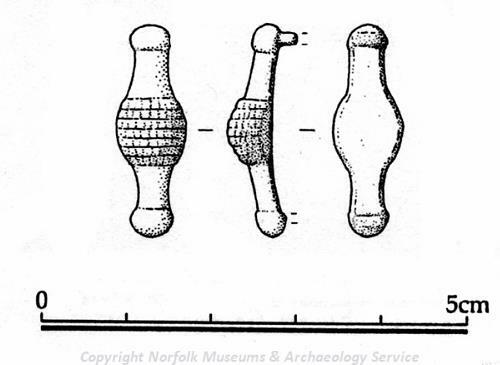 Settlement in Ashill continued to develop throughout the Iron Age; coins (NHER 4664, 25861, 25782), pottery (NHER 31587) and harness fittings (NHER 16140, 25782) have been found by metal detectorists. The pattern of Roman settlement is both interesting and complex. The site of a possible villa is close to the course of the Peddar’s Way (NHER 1289), a Roman road that also forms the western boundary of the parish. The course of another possible Roman road (NHER 8714) runs past the Panworth Ditch (NHER 1082) and the Roman enclosure (NHER 8712). This road (NHER 8714) is related to the course of a third Roman road (NHER 25846) that runs through the parish, which is visible in places as a slight earthwork. The Roman enclosure (NHER 8712) was excavated in the late 19th century when two timber shafts full of Roman pottery were discovered during the construction of the railway. The purpose of the enclosure and a Roman building within it is unknown, but probably fulfilled a military or more probably a ritual function. Finds of Roman metalwork including a ring (NHER 28293), brooches (NHER 29431 and 32964) and pottery are also concentrated in the northeast of the parish. 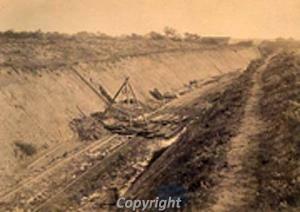 An excavation of a Roman enclosure in 1874 during the construction of the railway through Ashill. The Panworth Ditch, or Devil’s Dyke (NHER 1082), is the remains of a large linear earthwork. It probably dates to the Iron Age or the Early Saxon period and is closely associated with the possible course of a Roman road nearby (NHER 25846). Saxon strap fittings (NHER 29390), brooches (NHER 34584) and pottery (NHER 31537) have also been found close to the modern village of Ashill. During the medieval period Ashill was a thriving parish. A survey of 1418 in the Norfolk Record Office refers to ‘markaut place furlong’ that abutted onto ‘market gate’ near the parish church, suggesting the presence of a medieval market at Ashill. The parish church of St Nicholas (NHER 4719) is built in a mixture of styles, including Early English, suggesting that the parishioners of Ashill felt munificent enough to continually rebuild sections of their church. The deserted moated manor site of Panworth (NHER 4708), which was abandoned by the late 16th century, and the site of Uphall Manor (NHER 15411) survive as earthworks. Another area of deserted medieval settlement (NHER 4711) and a medieval moated site (NHER 4662) are in the southwest of the parish, around an area of former common. This suggests that medieval settlement in Ashill was much larger than it is now, with clusters of settlement around different moated sites. The site of a possible park boundary at the edge of the parish is probably associated with one of the manorial sites. 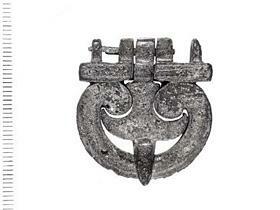 The discovery of silver hawk rings (NHER 30260), one belonging to Sir Clement Paston, and a medieval spur (NHER 29019) are evocative of the popularity of hunting and hawking in the medieval and post medieval periods. Sarah Spooner (NLA), August 2005.